Phil Mickelson insisted he meant no disrespect when he opted to putt a moving ball in the third round of the US Open - swallowing a sextuple bogey at the 13th hole. Many of Mickelson's peers were among those who felt his actions should have resulted in a disqualification from the U.S. Open, the lone event he needs to win to complete the career grand slam of golf's four majors. 'At that time, I just didn't feel like going back and forth and hitting the same shot over. Mickelson, who was celebrating his 48th birthday on Saturday, admitted he was happy to accept a two-shot penalty, which under Rule 14-5 covers "making a stroke at a moving ball". After his round, Mickelson admitted to intentionally hitting the moving ball because he didn't want it to roll off the green. "I didn't mean it disrespectfully, but if you're going to take it that way, that's not on me", Mickelson told reporters. Like anybody, good people make mistakes. "It's amusing. I just wanted to get to the next hole and did not see that happening without the two shots". 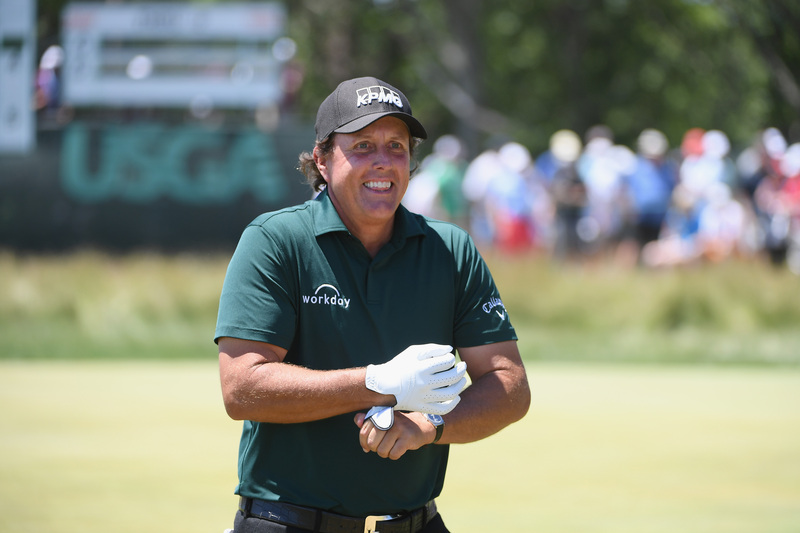 Mickelson sat in 63rd place after the third round at 17-over-par. "It's something you might see at your home course with your mates or something", Andrew Johnston said. John Daly infamously had struck a moving ball at the No. 2 hole at Pinehurst during the 1999 U.S. Open. I wasn't gonna have a shot. "If someone is offended I apologise, but toughen up". The Englishman also said he had been verbally abused on every hole by spectators, and at one point spectators cheered as his ball dribbled off a green with some loudly calling him a "clown". Rickie Fowler, who played alongside Mickelson in the final round, felt Mickelson had not been guilty of a breach of etiquette, adding: "It just shows you how borderline that pin [on 13] could be". The USGA said overnight watering would reduce green speeds, and hole locations would be set up to be more accessible to players. He was immediately issued with a two shot penalty for his actions and he's surely longing for the clubhouse now. Added two-time U.S. Open champion Curtis Strange: "I've never seen anything like that from a world class player in my life". Mike Davis, chief executive of the USGA said later: "We want the US Open to be tough, but we saw some examples late in the day where well executed shots were not only not being rewarded, but in some cases penalized". He offered that he knows the rules and that taking a two-shot penalty was better than the alternative. "I've never seen anything like that from a world-class player in my life", odd said. Zach Johnson said the USGA "lost the course".